Meawhile, Bill Donohue of the Catholic League has responded to the New York Times’s defense of its collaboration with Archbishop Rembert Weakland, OSB. not only sought to punish whistle-blowers─he ripped off the archdiocese to settle a sexual assault lawsuit brought by his 53-year old male lover. I added that because Weakland was a champion of liberal causes, the media were giving him a pass for his delinquency in not contacting the Vatican about Murphy for two decades. Hoyt has now joined the chorus. are not only *not* hated, but still respected by the mainstream media and members of the Church? Here’s an early childhood center named for Cardinal Bernardin! These guys have done their job of kowtowing to the power brokers. They’ve got the support of the gay activists. They’ve got the support of the liberal parishioners. Meanwhile, those regarded as “conservative” will be targeted for *anything*–including an ultra liberal liturgical innovator and Kennedy collaborator like Bernard Law. Look at how they are also eager to target bishops like Bruskewitz and Vasa for not towing the party line, even while such bishops have stricter policies than anyone else. “Bravi, Bravi, Bravissimi!”–I call *trilogy*!!! OK, I was highly resistant to the idea of a _Phantom_ sequel, but it was too good to resist, and, after a month of looking in stores, I finally found _Love Never Dies_ on CD Monday, and I listened to it today. . . . .
How dare I question the Master? Andrew, Lord Lloyd-Webber of Sydmonton, has done it. First, like all Lloyd Webber musicals, it begins in the future (not sure when; haven’t read the libretto). Madame Giry and someone else (I think Meg) are speaking. Then the overture, the “Coney Island Waltz,” plays. I wasn’t particularly thrilled with this melody when it premiered in October, and it’s one of the few previews we’ve gotten. It’s a tad nauseating. But it works in context. Strangely, where most ALW shows have “gone back in time” after the overture, there are a few more lines in “the present” until they overtly take us into the flashback. OK, Coney Island has just opened. It’s the very first day. The amusement park has been constructed in just one year by the mysterious “Mr. Y,” who rarely appears in public and, when he does, wears a mask. . . . The star attraction at Coney Island is Meg Giry, the “Bathing Beauty.” Meg is the Phantom’s new protege, and trying to win his affection. She and her mother have been serving him these ten years, helped him escape Paris, etc. 1) I expected, as in the dreadful book _Phantom of Manhattan_, that the Gustave-producing incident occurred *during* the events of the original story, totally negating the significance of the kiss at the ending. No. There is technically no retconning involved here. The musical clearly explains how the Phantom and Christine reunited for one night “beneath a moonless sky”–the night before her wedding to Raoul–and, this time, he left her. 2) Also unlike Frederick Forsythe’s travesty, this story plays on the doubt regarding Gustave’s paternity. He is extremely good-looking, suggesting the blend of Christine and Raoul, yet he is extremely musical as well, as well as a gifted prodigy in other ways (this *is* from Forsythe’s book, where the boy is a gifted engineer). 3) Reuse melodies. OK, no reprise of the most famous 3 tunes, except for the bass-riff of “Phantom of the Opera.” Actually, the one I would have liked to have heard, at the climax, was “Wishing You Were Somehow Here Again.” But they do reuse a few pieces, to great effect. “Love Never Dies” live, the recording is AMAZING. I’m not sure what the highest notes are, but I daresay that Sarah Brightman could not sing it. I recently read how the high note at the end of of the song “Phantom of the Opera” is the highest she’s ever been recorded singing. So, even though the melody was familiaar (and it’s only used once), it is executed. The other main song, “Till I Hear You Sing Once More” is used perhaps a tad too much but still powerful enough to carry the show. In our democratically minded culture, truth is often defined by numbers. The Church is constantly being pressured to “catch up with the times,” to stop teaching the Truth in favor of accepting the majority opinion of the world stage. Bishops and pastor’s often seem to measure the Church’s “success” on how many people are filling the pews and how many dollars are filling the collection baskets, fearing to teach the truth lest they drive people way. “Oh, the greatness of God, for sometimes one or two men alone can do more when they speak the truth than many together! Little by little, souls discover again the way; God gives them courage. If they are told there is danger in prayer, one of these servants of God will strive, if not in words then in deeds, to make known how good prayer is. If they are told taht frequent Communion is not good, he will receive more frequently. Thus, since there are one or two who fearlessly do what is best, the Lord at once begins to win back gradually the ground that was lost” (Way of Perfection, Ch. 21, para. 9). Also interesting in that she says the best way to convince people is to provide an uncompromising example, both in our words and in our deeds.
. . . or else they just come when we need them to prepare for disaster. I hate consolations, because they almost always mean spiritual attack. Whether God sends them when He knows the Enemy is going to strike, or whether Satan attacks when God sends them, the result is the same. Then the soul was restless and aflame with tremendous desire because of the unspeakable love she had conceived in God’s great goodness when she had come to see and know the expanse of his charity. How tenderly he had deigned to answer her petitions and give her hope in her bitterness–bitterness over God’s being offended and holy Church’s being ravaged, and bitterness over her own wretchedness, which she saw through the knowledge of herself! Her bitterness was softened and at the same time grew, for the supreme eternal Father, now that he had shown her the way of perfection, was showing in a new light how he was being offended and souls were being harmed. 1) They strengthen us against the despair of dealing with this hate-filled world. We’re never allowed to stay in them. Sometimes, the Enemy’s attacks come almost simultaneous to the consolations themselves. 2) As St. Teresa of Avila tells us, because “much is demanded of those to whom much is given,” consolations always come with an obligation to improve our own behavior. I never understood exactly what that expression means, but I think it applies to this fine article from US Catholic. You see, for decades, we’ve heard that “traditionalists” are just “old fogeys” who can’t cope with change, who can’t stand the fact that young people think differently than they do, that the Church is changing, etc. They’re just “overly attached” to the “old Mass” because it’s “all they’ve ever known,” etc. 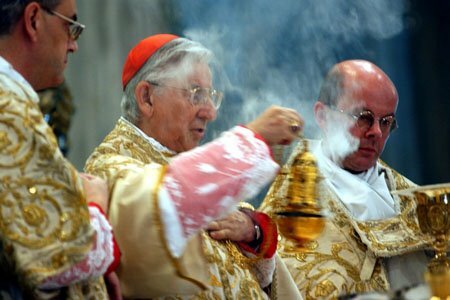 Yet now, as the writing is on the wall for the era of Liturgical Experimentation, the Boomers are now complaining about things changing from the way that is familiar to *them*, that they aren’t comfortable with these “young priests” who actually dress and act and speak like Catholic priests. Of course, the article contains the usual bugaboo that theses conservative young priests come from “sheltered” backgrounds. “Many of them were homeschooled!” (GASP!) And of course they’re “not pastoral.” Even though, in my experience, the “stuffy conservative” priests are far more eager to actually minister to their parishioners than the “easy going,” “friendly” “golf shirt wearing” priests —indeed, why do they wear golf shirts? So they can play golf! Then we get the reference to an older priest–himself a Dominican–wearing an Obama T-shirt while his young assistant pastor supports Palin. On how many levels is that wrong? He’s a Dominican, so he has the opportunity to wear the beautiful Dominican habit, and he turns it down for an Obama T-shirt? 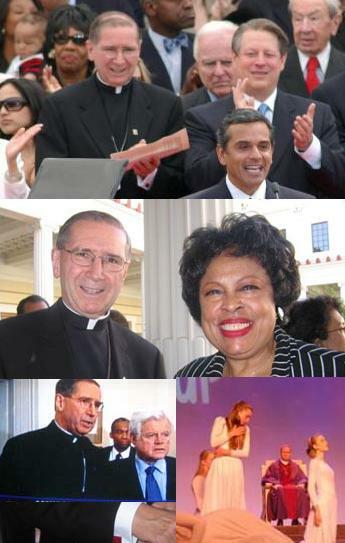 Perhaps someone should point out to this priest what happened to Andrew Greeley while he was wearing an Obama hat. . . . There is a bit of conventional wisdom and pop psychology, often proven in debate that women, in general, argue emotions while men argue logic. It is how the reprehensible expression “I feel” has permeated our discourse. The anti-war movement of the late 60s and early 70s coincided with the modern feminist movement, and was largely driven by emotion. Obviously, both sides of the abortion issue are driven by emotion. Ironically, though, in the past 8.5 years of American politics, a new form of emotion is developing vis-a-vis a war. While we still have the Cindy Sheehans of the world, and while we have plenty of women lamenting the deaths of people in the wars, and wanting the soldiers home, we have also seen the rise of the “security mom” as a force in American politics. Now, the shrieking mothers who want their sons home are counterbalanced by shrieking mothers who say their sons are being dishonored by the anti-war movement. Of course, I never said any such thing. I don’t understand how spreading our military too thin on interventionist wars in other people’s countries is keeping *us* safe. I don’t see how ringing up a multi-billion dollar tab in defense spending is protecting our kids’ future, especially when that tab is putting us deeper in debt to Communist China and Saudi Arabia, a debt that they will one day call? But these arguments make no dent in the wall of self-centered emotionalism that is the “security mom”. It’s just angry invectives, personal insults and, ultimately, getting “defriended” or banned from the forum. A typical security mom type defriended me a while back. This particular individual and I had disagreed on a number of Facebook discussions. The first time was a discussion of eschatology, where I was pointing out that the popular conception of “Heaven” is wrong, incompatible with Catholic teaching: we believe in the resurrection of the Body, and that will happen at the *end* of the world, as described in Revelation. I referred to St. Thomas Aquinas’ observation that what we call “heaven,” will be our true exile. This woman accused me of heresy, and kept citing passages from the Catechism that said exactly what I was saying but insisted they refuted me. She also told me that Catholics aren’t allowed to read the Book of Revelation. Later, in a discussion of waterboarding, she hit me with the “I’d hate to be one of your children” thing, and said my anti-waterboarding position was evil. Though that didn’t also stop her from making the comment that “there are only a few intrinsic evils: abortion, ESCR, and homosexual marriage,” citing the infamous “Faithful Citizenship” documente from the USCCB. I pointed out that a) there are *plenty* of “intrinsic evils” and b) in _Veritatis Splendor_, torture is listed under the *definition* of intrinsic evil. Then this led to her citing the fact that Cardinal Ratzinger said it’s OK for Catholics to vote for politicians who support the war (there’s a big difference for voting for them and cheering on the waterboarders), and that I was not even Catholic. . ..
Now, on my side, I frequently point out to these folks that they sound just like pro-choice Catholics, the way they manipulate Church teaching to justify their position and ignore the documents that are uncomfortable to them. That leads to either or both. They borrow Rush Limbaugh’s line, “You’re just a liberal pretending to be a conservative” (funny, since conservatives *used* to be the anti-war party). Technically, I didn’t compare an innocent baby to a terrorist–I compared our soldiers and CIA operatives to abortionists. Nowhere does the Church say that “innocence” is a standard for the Right to Life. The Church says that it is justifiable–i.e., not a sin, but not virtuous, either–to kill someone in self defense if you have tried all other reasonable means and your goal is not to kill that person but to stop them from doing evil. But there’s no use in arguing with a security mom, because they are driven by raw emotion, and not by logic. They’ll list “Catholic” politicians who support the war as evidence their position is OK, just as Democrat voters list “Catholic” politicians who are pro-choice. And they don’t see how they’re doing the same thing. And so, in their zeal for immediate protection against an imagined threat, they facilitate the government in laying the groundwork to round up Catholics, or homeschoolers, or pro-lifers, or whatever dissenting group they want to wipe out. J. K. Rowling was lying . . . When she insisted, early on, that the Harry Potter books should not be read in a search for Christian themes, and that they should not be compared to the works of C. S. Lewis and J. R. R. Tolkein. Earlier today, I came across this article, from MTV no less, and actually almost 3 years old, where Rowling talks about the Christian themes of the books, and how she didn’t want to reveal them too early in the series for fear of coloring the reading and giving away the ending. She mentions the explicit Christian references in _The Deathly Hallows_–the references Mary’s been talking about since she read it–as evidence. Here’s an article from Christianity Today, a few months before that interview, where the reviewer catches on. Also, despite what Michael O’Brien and other Fundamentalists-in-Catholic clothing would have you believe, the Pope never “condemned” the books. Before he was Pope, Cardinal Ratzinger received a book some German woman wrote on the Harry Potter books, and occultism in popular culture in general. He wrote a polite response back, saying it’s important to guard our children against the occult. He never explicitly said that Harry Potter was a source of the occult. And many also cite Fr. Gabriel Amorth’s statements on the subject. I’ve read statements where he said Harry Potter was evil, and I’ve also read where he said it was harmless fantasy. In either case, he admits he’s never read the books himself. He’s just basing it on the idea that people *can become interested in the occult by reading such books*, and I have no disagreement with that risk. But if the risk of that was enough to warrant censorship, then I guess we shouldn’t read the Bible, since a lot of people become interested in the occult from reading the Bible!